The most efficient way to spend money on the homeless might be to give it to them. Image: Getty Images. London, May 2009. Read the Dutch version here. A small Read the French version here. experiment involving thirteen homeless men takes off. They are street veterans. Some of them have been sleeping on the cold tiles of The Square Mile, the financial center of Europe, for more than forty years. Their presence is far from cheap. Police, legal services, healthcare: the thirteen cost taxpayers hundreds of thousands of pounds. Every year. ‘I didn’t have enormous expectations,’ an aid worker recalls. Yet the desires of the homeless men turned out to be quite modest. A phone, a passport, a dictionary - each participant had his own ideas about what would be best for him. None of the men wasted their money on alcohol, drugs or gambling. On the contrary, most of them were extremely frugal with the money they had received. On average, only 800 pounds had been spent at the end of the first year. We tend to presume that the poor are unable to handle money. If they had any, people reason, they would probably spend it on fast food and cheap beer, not on fruit or education. This kind of reasoning nourishes the myriad social programs, administrative jungles, armies of program coordinators and legions of supervising staff that make up the modern welfare state. Since the start of the crisis, the number of initiatives battling fraud with benefits and subsidies has surged. Meet Bernard Omandi. For years he worked in a quarry, somewhere in the inhabitable West of Kenya. Bernard made $2 a day, until one morning, he received a remarkable text message. ‘When I saw the message, I jumped up’, he later recalled. And with good reason: $500 had just been deposited into his account. For Bernard, the sum amounted to almost a year’s salary. A couple of months later a New York Times reporter walked Read the NYT article here. around his village. It was like everyone had won the jackpot - but no one had wasted the money. People were repairing their homes and starting small businesses. Bernard was making $6 to $9 a day driving around on his new Bajai Boxer, an Indian motor cycle which he used to provide transportation for local residents. ‘This puts the choice in the hands of the poor, and not me,’ Michael Faye, co-founder of GiveDirectly, the coordinating organization, said. ‘The truth is, I don’t think I have a very good sense of what the poor need.’ When Google had a look at his data, the company immediately decided to donate $2.5 million. Bernard and his fellow villagers are not the only ones who got lucky. In 2008, the Ugandan government gave about $400 to almost 12,000 youths between the ages of 16 and 35. Just money – no questions asked. And guess what? The results were astounding. A mere four years later, the youths’ educational and entrepreneurial investments had caused their incomes to increase by almost 50%. Their chances of being employed had increased by 60%. The study: ‘Experimental Evidence from Uganda’. Another Ugandan program awarded $150 to 1,800 poor women in the North of the country. Here, too, incomes went up significantly. The women who were supported by an aid worker were slightly better off, but later calculations proved that the program would have been even more effective had the aid workers’ salary simply been divided among the women as well. And the other study from Uganda. Studies from all over the world drive home the exact same point: free money helps. Proven correlations exist between free money and a decrease in crime, lower inequality, less malnutrition, lower infant mortality and teenage pregnancy rates, less truancy, better school completion rates, higher economic growth and emancipation rates. ‘The big reason poor people are poor is because they don’t have enough money’, economist Charles Kenny, a fellow at the Center for Global Development, dryly remarked last June. ‘It shouldn’t come as a huge surprise that giving them money is a great way to reduce that problem.’ Read his article here. In the 2010 work Just Give Money to the Poor, researchers from the Brooks World Poverty Institute, an independent institute based at the University of Manchester, give numerous examples of money being scattered successfully. In Namibia, malnourishment, crime and truancy fell 25 percent, 42 percent and nearly 40 percent respectively. In Malawi, school enrollment of girls and women rose 40 percent in conditional and unconditional settings. From Brazil to India and from Mexico to South Africa, free-money programs have flourished in the past decade. While the Millenium Development Goals did not even mention the programs, by now more than 110 million families in at least 45 countries benefit from them. Researchers sum up the programs’ advantages: (1) households make good use of the money, (2) poverty decreases, (3) long-term benefits in income, health, and tax income are remarkable, (4) there is no negative effect on labor supply – recipients do not work less, and (5) the programs save money. Here is a presentation of their findings. Why would we send well-paid foreigners in SUVs when we could just give cash? This would also diminish risk of corrupt officials taking their share. 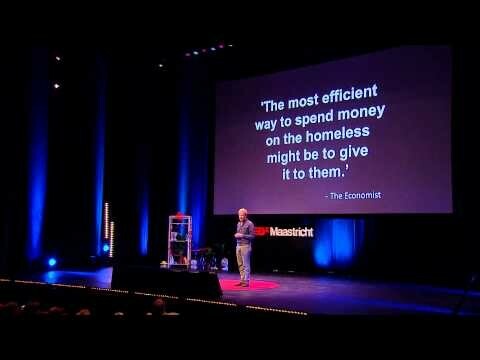 Free money stimulates the entire economy: consumption goes up, resulting in more jobs and higher incomes. Free money: the idea has been propagated by some of history’s greatest minds. Thomas More dreamt of it in his famous Utopia (1516). Countless economists and philosophers, many of them Nobel laureates, would follow suit. Proponents cannot be pinned down on the political spectrum: it appeals to both left- and right-wing thinkers. Even the founders of neoliberalism, Friedrich Hayek and Milton Friedman supported the idea. Article 25 of the Universal Declaration of Human Rights (1948) directly refers to it. And not just for a few years, in developing countries only, or merely for the poor – but free money as a basic human right for everyone. The philosopher Philippe van Parijs has called it ‘the capitalist road to communism.’ A monthly allowance, enough to live off, without any outside control on whether you spend it well or whether you even deserve it. No jungle of extra charges, benefits, rebates - all of which cost tons to implement. At most with some extras for the elderly, unemployed and disabled. The basic income - it is an idea whose time has come. In an attic of a warehouse in Winnipeg, Canada, 1,800 boxes are accumulating dust. The boxes are filled with data – tables, graphs, reports, transcripts – from one of the most fascinating social experiments in postwar history: Mincome. Evelyn Forget, professor at the University of Manitoba, heard about the experiment in 2004. For five years, she courted the Canadian National Archive to get access to the material. When she was finally allowed to enter the attic in 2009, she could hardly believe her eyes: this archive stored a wealth of information on the application of Thomas More’s age-old ideal. One of the almost 1,000 interviews tucked away in boxes was with Hugh and Doreen Henderson. Thirty-five years earlier, when the experiment took off, he worked as a school janitor and she took care of their two kids. Life had not been easy for them. Doreen grew vegetables and they kept their own chickens in order to secure their daily food supply. One day the doorbell rang. Two men wearing suits made an offer the Henderson family couldn’t refuse. ‘We filled out forms and they wanted to see our receipts’, Doreen remembers. From that moment, money was no longer a problem for the Henderson family. Hugh and Doreen Read more about their experience here. entered Mincome – the first large-scale social experiment in Canada and the biggest experiment implementing a basic income ever conducted. ‘Politicians feared that people would stop working, and that they would have lots of children to increase their income,’ professor Forget says. You can find one of her lectures here. Yet the opposite happened: the average marital age went up while the birth rate went down. The Mincome cohort had better school completion records. The total amount of work hours decreased by only 13%. Breadwinners hardly cut down on their hours, women used the basic income for a couple of months of maternity leave and young people used it to do some extra studying. Several tens of millions were made available to test the effects of a basic income among 10,000 families in Pennsylvania, Indiana, North Carolina, Seattle and Denver. The pilots were the first large-scale social experiments differentiating between various test and control groups. The researchers were trying to find the answers to three questions. 1: Does a basic income make people work significantly less? 2: If so, will it make the program unaffordable? 3: And would it consequently become politically unattainable? Milestones of civilization are often first considered impossible utopias. Albert Hirschman, one of the great sociologists of the previous century, wrote that utopian dreams are usually rebutted on three grounds: futility (it is impossible), danger (the risks are too big) and perversity (its realization will result in the opposite: a dystopia). Yet Hirschmann also described how, once implemented, ideas previously considered utopian are quickly accepted as normal. Not so long ago, democracy was a grand utopian ideal. From the radical philosopher Plato to the conservative aristocrat Joseph de Maistre, most intellectuals considered the masses too stupid for democracy. They thought that the general will of the people would quickly degenerate into some general’s will instead. Apply this kind of reasoning to the basic income: it would be futile because we would not be able to afford it, dangerous because people would stop working, and perverse because we would only have to work harder to clean up the mess it creates. Futile? For the first time in history we are rich enough to finance a robust basic income. It would allow us to cut most of the benefits and supervision programs that the current social welfare system necessitates. Many tax rebates would be redundant. Further financing could come from (higher) taxing of capital, pollution and consumption. Eradicating poverty in the United States would cost $175 billion – a quarter of the country’s $700 billion military budget. A quick calculation. The country I live in, Holland, has 16.8 million inhabitants. Its poverty line is set at $1,300 a month. This would make for a reasonable basic income. Some simple math would set the cost on 193.5 billion euro annually, about 30% of our national GDP. That’s an astronomically high figure. But remember: the government already controls more than half of our GDP. It does not keep the Netherlands from being one of the richest, most competitive and happiest countries in the world. The basic income that Canada experimented with – free money as a right for the poor – would be much cheaper. Eradicating poverty in the United States would cost $175 billion, economist Matt Bruenig recently calculated – a quarter of the country’s $700 billion military budget. You can find his calculation here. Still, a system that only helps the poor confirms the divide with the well-to-do. ‘A policy for the poor is a poor policy,’ Richard Titmuss, the mastermind of the British welfare state, once wrote. A universal basic income, on the other hand, can count on broad support since everyone benefits. Dangerous? Indeed, we would work a little less. But that’s a good thing, with the potential of working wonders for our personal and family lives. A small group of artists and writers (‘all those whom society despises while they are alive and honors when they are dead’ – Bertrand Russell) may actually stop doing paid work. Nevertheless, there is plenty of evidence that the great majority of people, regardless of what grants they would receive, want to work. Unemployment makes us very unhappy. One of the perks of the basic income is that it stimulates the ‘working poor’ – who are, under the current system, more secure receiving welfare payments - to look for jobs. The basic income can only improve their situation; the grant would be unconditional. Minimum wage could be abolished, improving employment opportunities at the lower ends of the labor market. Age would no longer need to form an obstacle to finding and keeping employment (as older employees would not necessarily earn more) thereby boosting overall labor participation. It has been said before. Our welfare state is out of date, based on a time in which men were the sole breadwinners and employees stayed with one company for their entire careers. Our pension system and unemployment protection programs are still centered around those lucky enough to have steady employment. Social security is based on the wrong premise that the economy creates enough jobs. Welfare programs have become pitfalls instead of trampolines. Never before has the time been so ripe to implement a universal and unconditional basic income. Our ageing societies are challenging us to keep the elderly economically active for as long as possible. An increasingly flexible labor market creates the need for more security. Globalization is eroding middle-class wages worldwide. Women’s emancipation will only be completed when a greater financial independence is possible for all. The deepening divide between the low- and highly educated means that the former are in need of extra support. The rise of robots and the increasing automatization of our economy could cost even those at the top of the ladder their jobs. A world where wages no longer rise still needs consumers. In the last decades, middle-class purchasing power has been maintained through loans, loans and more loans. The Calvinistic reflex that you have to work for your money has turned into a license for inequality. That is how all progress begins. Translated from Dutch by Tabitha Speelman.